Watch online construction courses taught by industry Pros. ✓ Make More Money ✓ And Much More! Online courses taught by professional contractors. to help grow your business or skills. What pain do you want to solve? on any device. Go back and re-watch anytime, it never expires. who will help you grow your business, skills, or knowledge. Grow your business, skills, & knowledge... on any device. Hey, we get it. You're busy from sunrise to sunset. With Construct-Ed, you can learn from Pros on-the-go. Listen and learn on your phone, to and from the job-site. Watch construction classes on your laptop at home, or anywhere else you have internet access. Construct-Ed goes where you do, so you can learn what you need, when you need it. Browse over 180 courses on everything form business management and profit growth, to estimating, leadership, and green building education. "I enjoyed this class for the detail it carries and how every detail flows with the other. I liked how this course broke it down and used examples to understand. Thank you." "Thanks for the training - the 5 steps to leadership growth and development process. It was very helpful for me." "Very informative. The course breaks everything down in an easy to understand way for those of us new to estimating." Online construction courses for pros, by pros. Start growing your business, skills, and knowledge today. 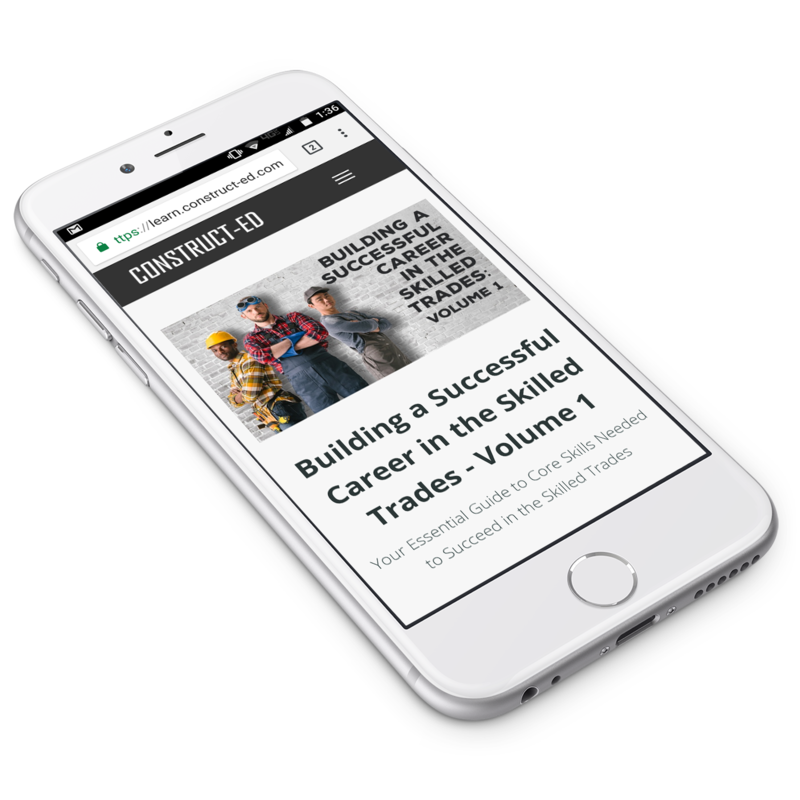 Construct-Ed is a platform of online construction courses and online construction classes where anyone in the construction and skilled trades industry can learn from real pros in the industry. Search our ever-growing library and find a large selection of free online courses, construction classes, as well as home construction courses, construction estimating courses, business management courses, online building courses, and more. If you’re a general contractor, get educated and learn the skills you need from experienced pros to grow your business and knowledge. If you’re a business owner, help educate and train your employees online, and save time and money. Learn anywhere, anytime. Once purchased, you own the course for life. Learn the skills you need to grow your business, or start your own. Our courses are published and taught by experienced experts in their trade.